Galaxies are not as isolated as they at first glance may seem, on a cosmic scale they congregate in clumps along with dark matter and hot gas. The colourful blob in this new composite image, based on data from several telescopes including ESA's XMM-Newton, is the group of galaxies known as the Bullet Group. Its components appear to be clearly separated, with the hot gas partitioned from the rest of the mass within the group. This is the smallest object ever found to show such an effect, which was caused by a merger in the group's past. Despite the large distances between them, galaxies rarely exist in isolation. They are mostly found in large assemblies known as groups and clusters. Groups are the smallest gatherings, containing 50 or so galaxies bound together by gravity, whereas clusters are somewhat larger, consisting of hundreds or thousands more. These structures also contain large amounts of hot gas that fills the space between galaxies and shines brightly in the X-ray part of the spectrum, and even larger amounts of dark matter, which does not emit light but can be detected via its gravitational effect on other objects. This invisible dark matter provides scaffolding for galaxies and hot gas, and its gravity affects the build-up of large cosmic structures. In most cases, galaxies and hot gas are found in the pockets of the Universe where the dark matter is densest, but when groups or clusters of galaxies collide with one another, their different constituents do not mix well. These cosmic clashes give rise to curious configurations where hot gas, which comprises the bulk of ordinary (baryonic) matter in a group or cluster, may lie in one region, while galaxies and dark matter lie elsewhere. This is certainly the case in this image of SL2S J08544-0121, an object now nicknamed the Bullet Group. This group was created by such a collision, and what we see is the aftermath of this cosmic tussle. The group's diffuse gas is so hot that it strongly radiates X-rays, detected by ESA's XMM-Newton X-ray Observatory and shown here in pink. While the hot gas is concentrated in one large bubble, the rest of the group's mass – consisting of dark matter (shown here in blue) and galaxies – appears to be split into two distinct parts. Astronomers believe that the blob to the right of the image centre acted as a "bullet", travelling from the lower left towards the upper right of the image. In the process, it impacted the other sub-structure of the group, and passed through it. Mergers mix the contents of galaxy groups and clusters, but each component behaves differently. While the galaxies and dark matter from both colliding parties did take part in the Bullet Group merger, they were almost unaffected by this event and remained confined in the original sub-structures, as shown in this image. However, particles in the two colliding clouds of hot gas did interact with one another via the electromagnetic force, and the resulting friction caused the gas from the two merging parties to mix, creating a single billowing cloud. 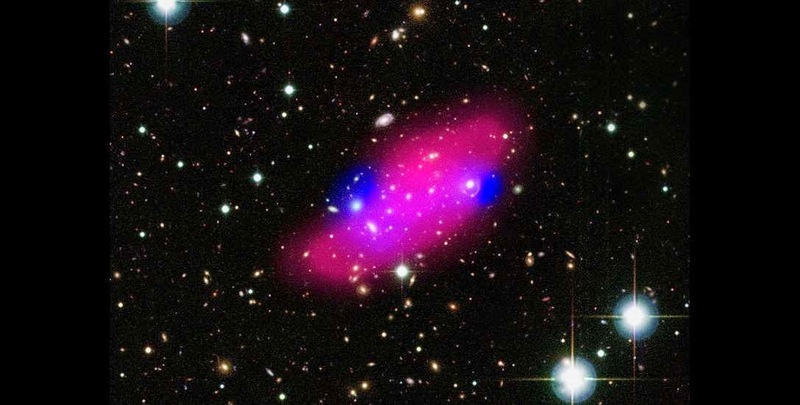 This curious separation of gas, galaxies, and dark matter has been observed so far in a handful of massive galaxy clusters, including the famous Bullet Cluster. However, it had never been seen before in lower-mass objects such as galaxy groups, making the Bullet Group the smallest structure in which this effect has been detected. Although it is not visible to the eye – nor to any type of telescope – astronomers were able to map the extent of the Bullet Group's dark matter by tracing the effect it has on the light from distant galaxies lying behind the group. This distortion, called gravitational lensing, is caused when light passes by a massive object such as a galaxy, which gravitationally affects the space around it, causing the space to bend and curve. The paths of light from the more distant object are also bent and curved, sometimes creating bizarre optical effects. If the lensing object is very massive and favourably aligned with the background source of light, this effect becomes even more dramatic and striking – a phenomenon known as "strong gravitational lensing". It can turn galaxies into rings or bright arcs smeared across the sky, and it even creates multiple images of the same galaxy. This can be seen in the centre-right part of this image, where a round, bright galaxy that belongs to the Bullet Group is circled by curious arcs of light – the distorted image of another galaxy lying much farther away. This image is a composite of an X-ray image (shown in pink) from ESA's XMM-Newton observatory, a three-colour (red, green, blue) optical image from the Canada-France-Hawaii Telescope (CFHT), and a dark matter overlay (shown in blue) based on data from CFHT, the NASA/ESA Hubble Space Telescope, and the W. M. Keck Observatory. Bright foreground stars that belong to our Galaxy are also visible scattered across the frame.